I just found a marketing flyer from my block company days that shows our 12-person sales staff. It has been eight years since I sold the company so I’ve only seen a few of these guys since then. Their faces bring back good memories. Have I ever shown you Glenstone Block Company? This is a poor picture taken through glass of a mounted photograph. You can see my image lurking in the background like Marley visiting Scrooge. Or maybe it’s just my ghost overlooking my old haunting grounds. 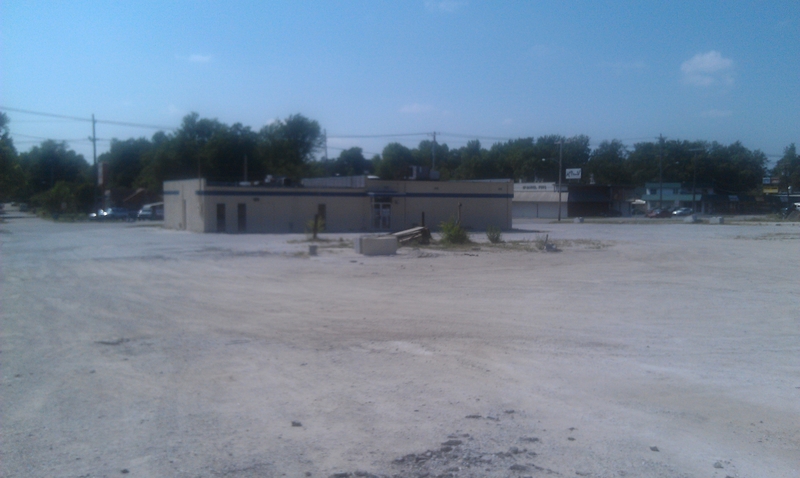 This was our main location at 928 S. Glenstone in Springfield. We had another manufacturing plant in Branson and six hardware stores located in four communities. Yesterday Sandy and I signed a lease allowing a new company to move into my old office building in Springfield, where I worked for thirty-five years from 1973 to 2008. It was the home office of Glenstone Block Company. I was owner and president. During the day my world centered on the manufacture and sales of concrete blocks for the construction industry. We had a plant in Springfield, one in Branson, and a stocking yard in Camdenton. At one time we also operated half a dozen True Value and ACE hardware stores in Springfield, Kaiser, Branson West, and Camdenton. At it’s peak, the company employed over one hundred men and women. This week I pulled out a scrapbook created as a gift for me in 1993 by my secretary Dixie Nyer. Memories came flooding back as I turned the pages, pausing over faces I haven’t seen for many years. We were all so young! I’d forgotten about the newsletter I occasionally wrote (with ample help from several others in the company). A company survey had shown that employees wanted to know more about how business worked so I wrote a series of articles about a fictitious small businessman named Fernando who started a company to manufacture Belly Button Lint Cups. Poor guy had a heck of a time figuring out how to control his inventory, price his product, keep his expenses in check, and somehow make a profit. It was another life, filled with meetings, decisions, trying to keep up with trends and stay ahead of competition. 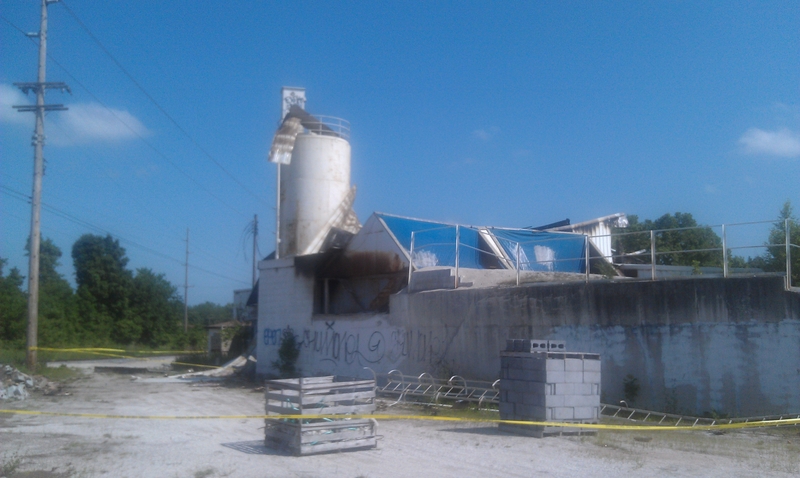 Several of the people who helped make Glenstone Block Company what it was are gone. I’ve lost track of most of the others. One, I’m happy to say, my former administrative assistant Elaine Gold, still comes to my house once a month to pay bills and do my filing. Okay, I’m spoiled. Another ex-employee, Karen Stewart, now performs the same duties at our gift store, Gamble’s. Dixie, herself a writer, penned this poem for the opening page of her gift scrapbook. It’s over the top but Dixie never got over the fact that I hired her when she was down and out, cleaning motel rooms and barely making it. I hired her to do our advertising and picked her from several applicants with strong credentials. I chose Dixie on two counts: she was a writer and she professed to dislike advertising. I figured that would give her a reason to come at our ads from a different point of view, and she never disappointed me. I can still hear her squeal of joy over the phone when I called to offer her the job. When I sold my company, I became a fulltime writer after a lifetime of writing before work or after I got home. I was 71. Here’s a repeat from May 7, 2012. 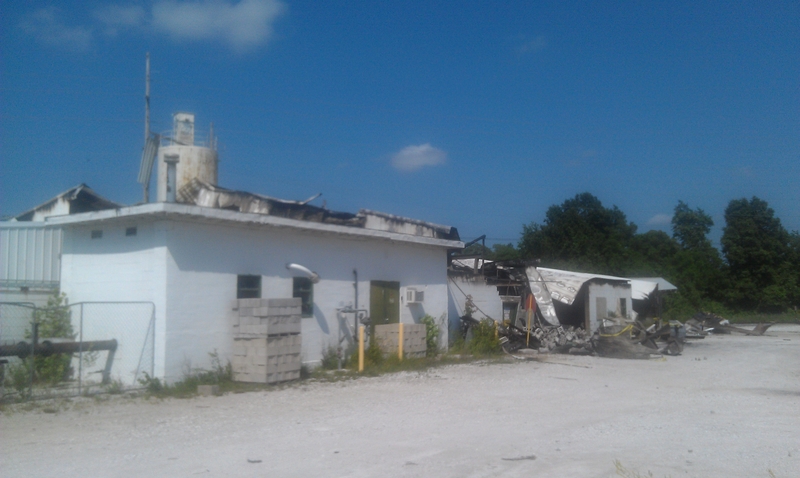 An arsonist had just burned down the block plant that my father and two partners started in 1945. A lot has happened since then but I took that occasion to write something about the wonderful man I was lucky enough to call Dad. Today, December 7, officially marks the day that Dad died in 1989. That’s what the hospital record said. Truth is he died just before midnight on the 6th in my arms on the floor in our house after a fatal heart attack. He was kept on life support during the ambulance ride to the hospital but nothing could be done. My father, John Harrison, was a good man. He was a good son too. His father died when John was twelve. At age sixteen he started working part time to help his mother and two sisters get by. His first job was on the excavation crew for a company that laid gas mains. He carried a water bucket and dipper to thirsty men in the ditches. To break in the new kid, the men took turns yelling, “Water boy!” first from one end of the line, then the other. John’s father and uncles were all veterinarians, his aunts all nurses. John didn’t have the opportunity to pursue a career. Immediately after graduating from high school he went to work fulltime for the city. During the next sixteen years, he never missed a day. Like many people, John dreamed of having his own business. In 1945, he joined with Bill Pauly and Guy Hall to create a company that manufactured concrete blocks for the construction industry. Bill was a carpenter, big and rough, proud of his skills and his raw strength. 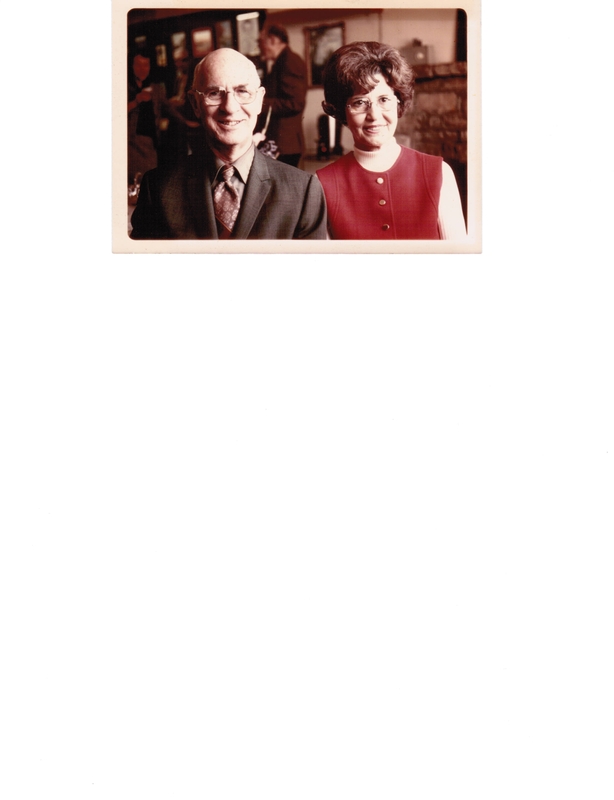 My dad was six feet tall but slender, bald, bespectacled, an office type good at math and record keeping. Guy worked for a lumber yard and didn’t become an active member of the firm until years later. Bill and my dad built the block manufacturing building at the back of the lot they leased at 928 S. Glenstone in Springfield, Missouri. Bill knew how to do it so he was foreman. During construction, Dad was a walking disaster. He would come home after a day of back breaking work with cuts on his head from banging into low beams, his hands so blistered that he could hardly make a fist. But day by day the plant took shape and eventually they got it done. My father was proud of what he had helped accomplish. My first job was sickling down weeds at the front of the lot with Bill’s son Billy. We were eight years old. Glenstone Block Company grew slowly, but it lasted. A lot of men raised their families on their pay from the firm. Sometimes Dad would take the whole crew to the river to fish. I remember riding on a flatbed truck down bumpy roads, trailing dust on those following us to the water. On one occasion, Bill nailed the head of a large catfish to the office door. Dad was furious. Bill couldn’t stop laughing. In October, 1972 Dad became the last member of the original three partners. After running the company for twenty-seven years, he was ready to retire. In February, 1973 I accepted his offer to join him. I resigned from my position in Kansas City as Editorial Manager for Hallmark Cards and moved my family to Springfield. I managed the company as president for thirty-five years until I sold it in 2008. John Harrison’s dream grew even after his death in 1989. The company expanded until it had one hundred employees operating two block plants, a distribution yard, a precast plant, and six hardware stores in five communities. After I sold the company, the new owner – also a block manufacturer – shut down the operation when the economy wouldn’t support it. The buildings, including the modern replacement of the plant that John and Bill built sixty-two years earlier, fell silent. The yard, once stacked with inventory, lay vacant. Vagrants came. Vandals stripped copper from machinery, stole steel pallets, and covered the walls with graffiti. Monday night, April 30, 2012, someone set fire to the plant. I don’t understand how some people are capable of such destruction. I hope that person is caught. I hope he gets the help he needs before he hurts someone, before he destroys the memory-filled property of another family. My dad was a man of his word. He was liked, admired, and trusted by everyone. He was a loving husband to Neva and father to my sister Jule and me, a dedicated fisherman, and an honest friend. He also believed that you don’t spend your life feeling sorry for yourself or blaming others. The loss of his father when he was so young changed is life forever. He didn’t become a veterinarian. He started a company that supported hundreds of men and women over a period of six decades. In John Harrison’s world, you do the best you can with the cards you’re dealt. The fire the other night has brought back many wonderful recollections of my father. For that, at least, I can thank the man who burned down Dad’s block plant.